Judging by the tone of the cover, it seems that Daredevil will stay in the “dark and gritty” vein, which I consider to be very good news. I like my Daredevil grounded and in the gutter (though not necessarily filled with tragedy of shakespearian proportions, but I don’t see why the two have to always go together). I’ve been suspecting that we would see the “Man Without Fear” slogan dropped from the cover, and it looks like I’m right. This isn’t too surprising given that Black Panther’s title has taken over that label, but I suspect they might make a point of Matt now being a man who feels fear. Not that he didn’t always feel fear. I’m sure you know what I mean. The teaser image is by Marco Checchetto. This could mean nothing beyond this single piece of art, but is worth noting. UPDATED: Bleeding cool is now reporting (leaking? suspecting?) that the new creative team is Mark Waid and Paolo Rivera. Read more here. Thoughts and comments? For more info, check out CBR. Also, stay tuned for the big reveal on Saturday when we find out who will make up the creative team behind this baby. I will try to cover it live, even if it means I have to get up in the middle of the night my time (and that is in fact what it means)! 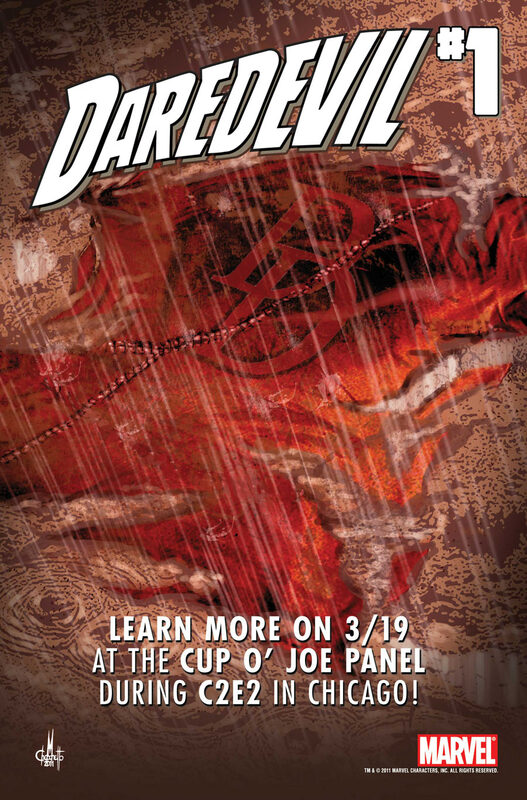 I’ll see you later tonight for a discussion of the Daredevil movie news. I for one would be ecstatic if Mark Waid were indeed the writer. I would however prefer Marco Checchetto over Paolo Rivera as interior artist (maybe with Paolo Rivera on covers though as he’s done a few great ones for DD recently). My sources (doesn’t that sound enigmatic? ;)) confirm that Waid is the new writer. I think he could be a good choice, maybe make the title a little lighter without changing gears completely. I think Rivera is perfectly fine, but I’m not over excited. His interior art looks a bit too “blocky” for me if that makes sense. I prefer more detail. His covers, as you say, have been beautiful though, and I’ve liked what he’s done in Spider-Man. I remember reading some caps written by Mark Waid,and wasn’t so thrilled about them, but it was so many years ago. It was another relaunching operation if my memory ‘s helping me..
Waid has certainly written some fine stories over the years; Rivera’s art is not my cup of tea really. I’m rather jealous of the team supposedly going to PUNISHER: Greg Rucka and Marco Checchetto. I am completely interested in the Waid/Rivera team. I don’t know who I thought it was going to be, but I’m genuinely happy with this choice. Can’t wait! Mark Waid is awesome. That teaser image does say “gritty streets”, but hopefully his Daredevil won’t be all doom and gloom like the last few years of the character. Let Matt be a swashbuckling hero for a while before we have “Born Again 7.0” We all know thats coming eventually as sure as Aunt May will never die. That being said, Punisher got the best writer by far. Very far. No offense to Waid or Bendis, but I’ve never read any comic by Rucka that wasn’t well done. Can’t say the same for Waid and certainly couldn’t say that about Bendis. Rucka is doing Punisher? Make way for a strong, lesbian supporting character! As for Waid/Rivera, it could work. I LOVE Paolo Rivera’s artwork, but I’m not sure he can actually handle a monthly. I’d like to be proven wrong though(or he get alternating issues with artists that match his style, like Marcos Martin or Javier Paluido). Are those Rosary beads in the image? (they don’t look ‘very’ much like them, but that’s the best explanation I can think of). I was hoping for Jason Aaron. Bummer. Waid was one of the guys I was hoping for (Rucka was the other). He’s very versatile and can usually figure out what it is that makes a character work. I don’t expect anything groundbreaking, just solid stories and character development. I’m a tad concerned about Mark Waid… Paolo Rivera’s artwork in the One Moment in Time Amazing Spiderman issues was well, AMAZING! Gorgeous stuff, seriously. His work is superb, but I’m having a really difficult time seeing it fit within Daredevil. Unfortunately, I do not feel a grim and gritty style for this book coming our way. If anything his style leans more towards a “retro in the past cartoony” look. LOVE his work, but wow is this a change for ole’ DD. Are those Martha Wayne’s pearls? Is Matt going to kill Batman’s parents? I abhor the sales promotion of a new #1 for a title, but I’ll buy it regardless. As for Waid, I hope this is true. Waid is a terrific writer and he usually brings joy and new energy to any comic he writes. While he’s not my first choice for gritty noir, I hope this implies a change of focus for the character. Still be dark, but strike more of a balance towards a more happier Matt.